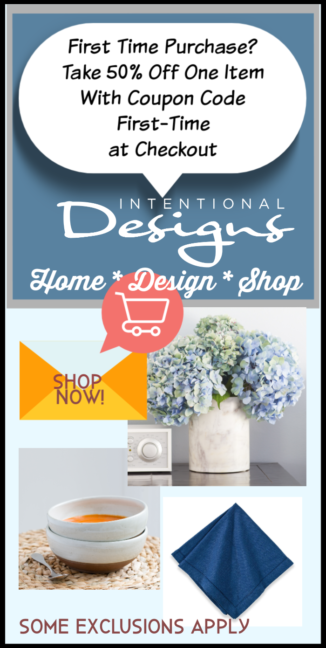 DIY Ultimate Retreat Paint Colors! 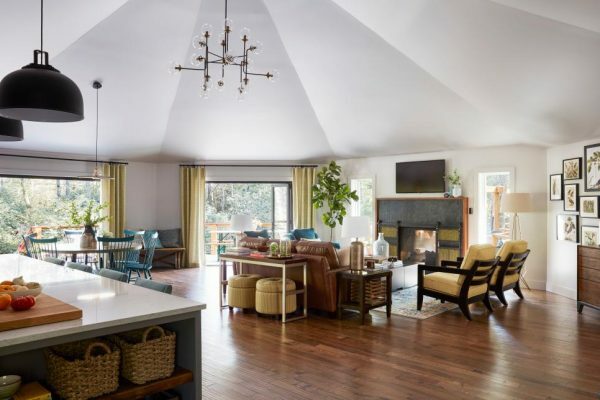 The DIY Network revealed their Ultimate Retreat this week. 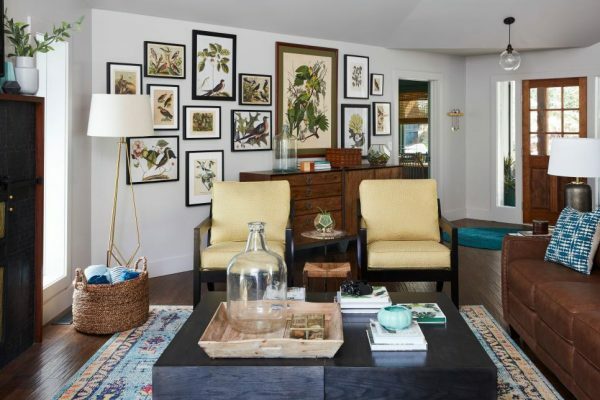 Located in Sapphire, North Carolina the home is a magnificent makeover from the inside out! 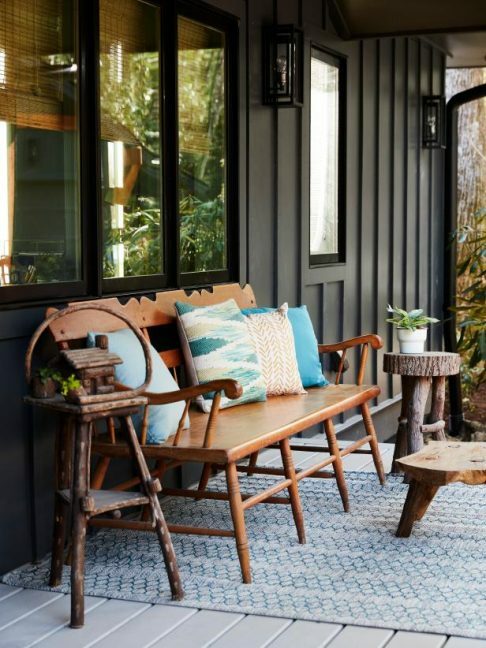 Looking for paint color inspiration, then take a look at the paint colors used in this year’s DIY Ultimate Retreat! 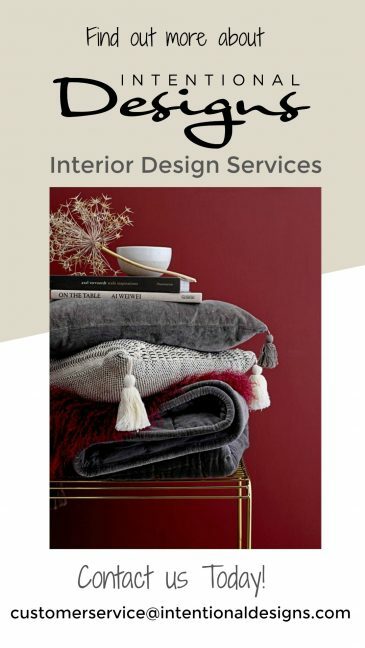 So, immediately the home welcomes you with a design aesthetic that is focused on nature. 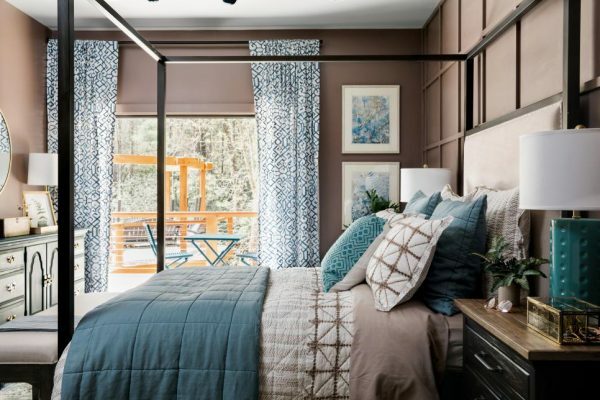 And the home’s interior and exterior paint palette is as serene as it’s surroundings. 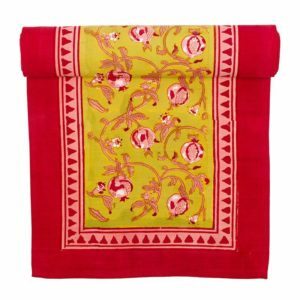 But with an unexpected infusion of color throughout each room. 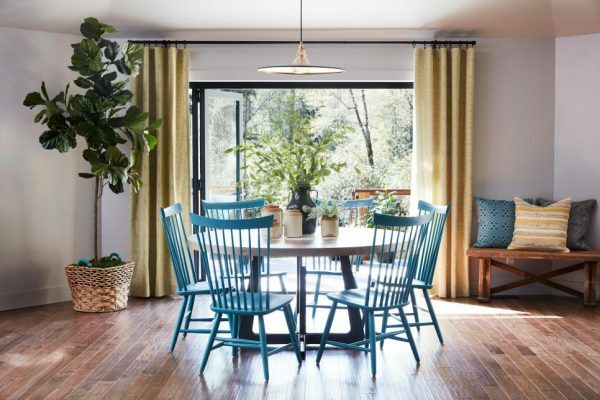 From teal to blue, bright greens and shades of yellow this home is cheerful, serene & fun! First, the Entryway: Paint Color: Sherwin-Williams Alpaca HGSW2467. Then moving into the Great Room: Paint Color: Sherwin-Williams Alpaca HGSW2467. 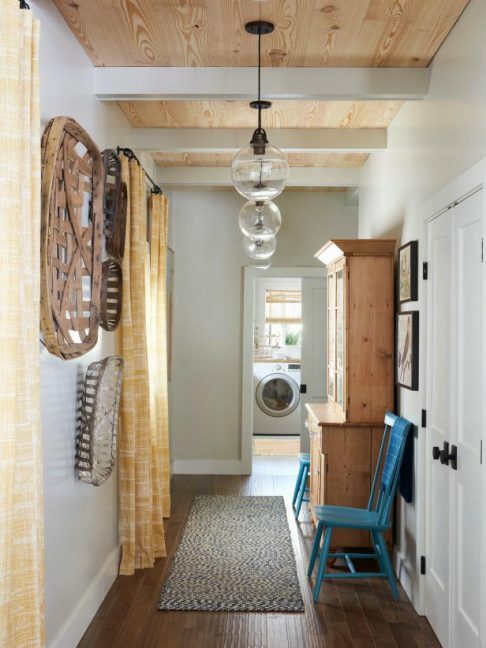 With a color palette that consists of blue, white, yellow and warm wood accents. Third, the Dining Room: Paint Color: Sherwin-Williams Alpaca HGSW2467. Furthering a comfy cozy aesthetic with a “Modern meets Traditional” vibe. Fourth, Kitchen: Paint Color: Sherwin-Williams Alpaca HGSW2467. 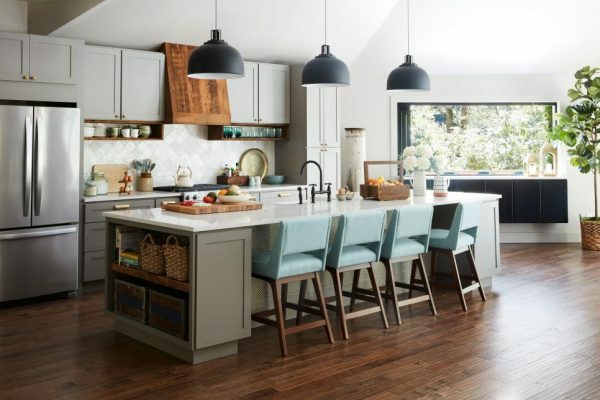 The color palette combines soft tones of gray, white and blue. Together with Platinum Gray Shaker Cabinets with Brass hardware. First, Paint Color Walls: Sherwin-Williams Less Brown HGSW3432. Second, Paint Color Ceiling: Sherwin-Williams Gray Screen HGSW1467. 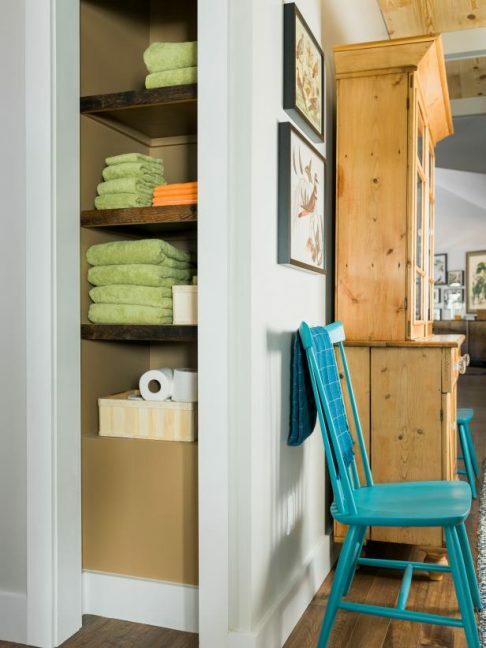 And the Master Bathroom: Paint Color: Sherwin-Williams Adaptive Shade HGSW3493. 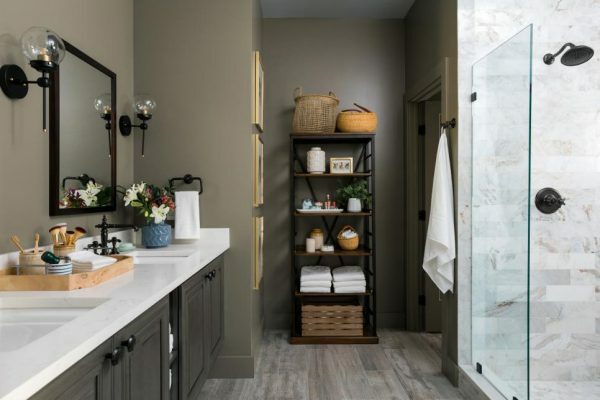 “A Spa-like escape” with an earthy gray paint color. Complete with a walk-in shower and freestanding bathtub. 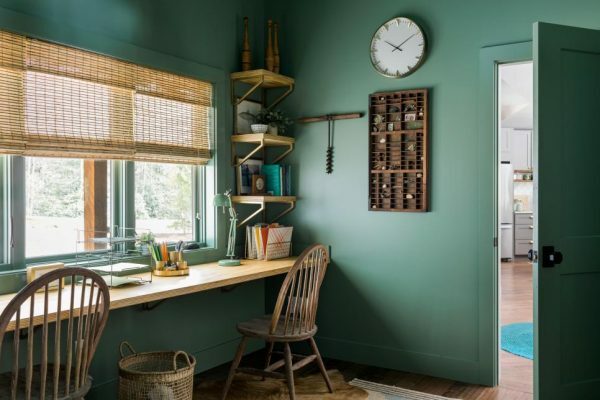 Seventh a bonus Study: Paint Color: Sherwin-Williams Privilege Green HGSW3253. “A curated look” complete with reclaimed items and vintage finds. 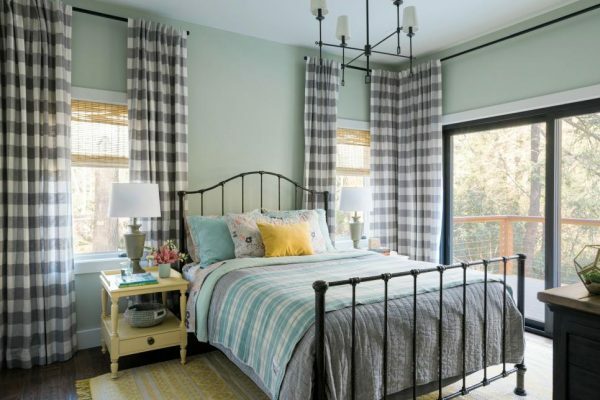 Then a Guest Bedroom: Paint Color: Sherwin-Williams Liveable Green HGSW3247. “Restful Relaxation” in green & gray. With beautiful gray and white buffalo check drapery panels. And a Guest Bathroom: Paint Color: Sherwin-Williams Divine White HGSW4044. 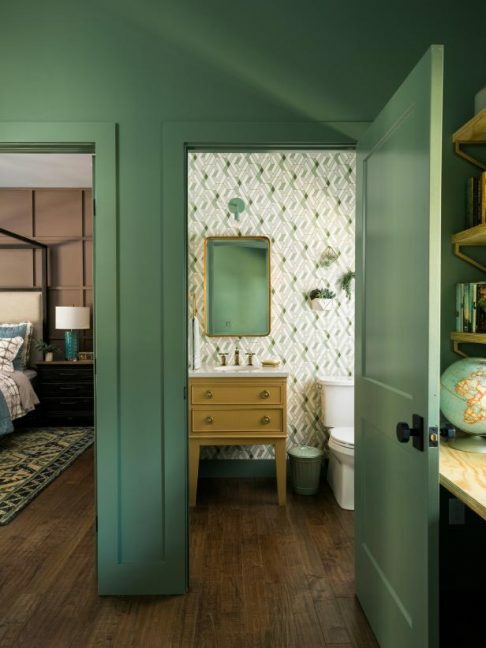 “Wow-Worthy Charm” complete with green ceramic subway tiles. And Hallway details that further the design. First, Paint Color Walls: Sherwin-Williams Nuance HGSW4060. Pine Ceiling: Clover Lea Southern Yellow Pine. Second, Paint Color Open Linen Closet: Sherwin-Williams Hopsack HGSW3143. Third, Paint Color Outside Guest Bathroom: Accent Wall: Sherwin-Williams Useful Gray HGSW3497. DIY Ultimate Retreat Bunk Room! 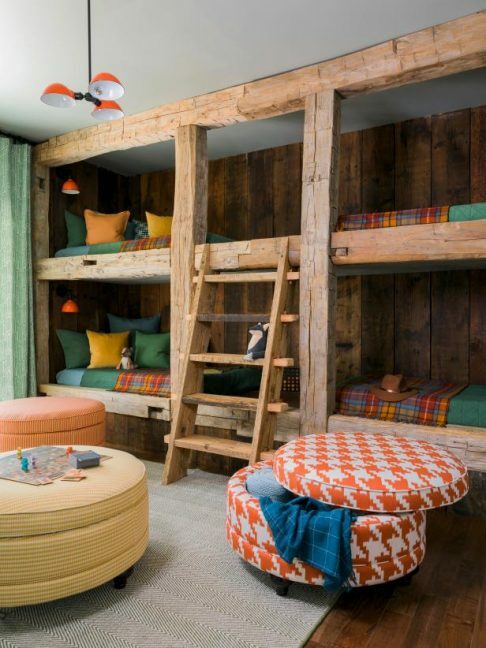 What mountain retreat would be complete without a Bunk Room! Paint Color, Ceiling: Sherwin-Williams Rare Gray HGSW3275. Full of “Mountain Vibes” complete with custom bunk beds & a custom painted wall mural. 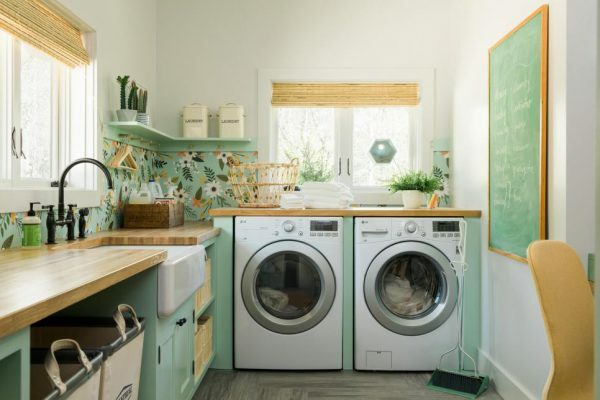 Plus a Laundry Room fit for a family! First, Paint Color: Sherwin-Williams Nuance HGSW4060. Second, Paint Color Over Desk: Sherwin-Williams Mannered Gold HGSW2173. 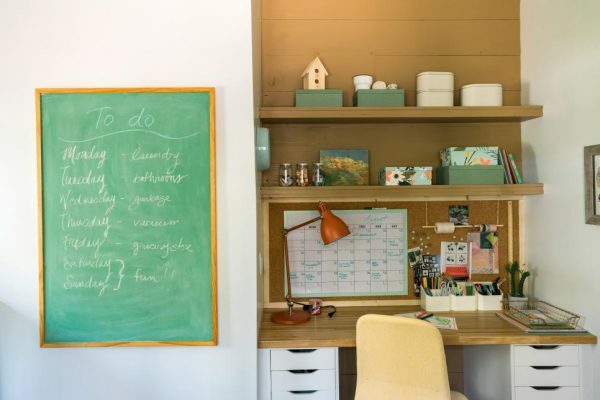 “Multi-purpose space with “clever storage & organizational ideas”. 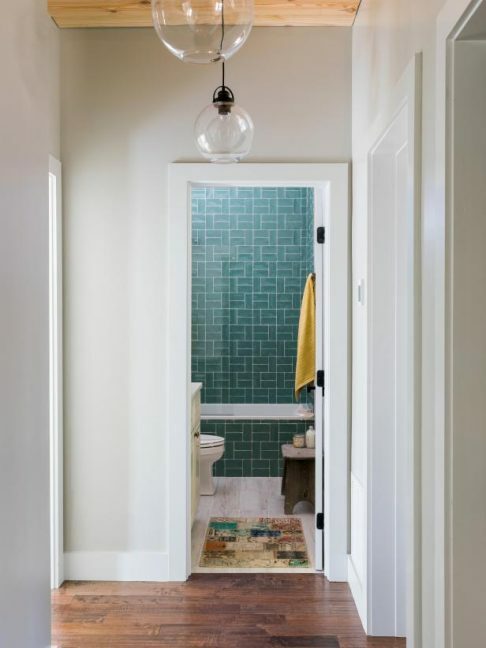 And a DIY Powder Room project: With wallpaper in a geometric pattern and an upcycled vanity! And the exterior is a combination of Hardi Fascia Trim, Shingle Siding Straight Edge Panel, and Vertical Siding Smooth, Iron Gray. 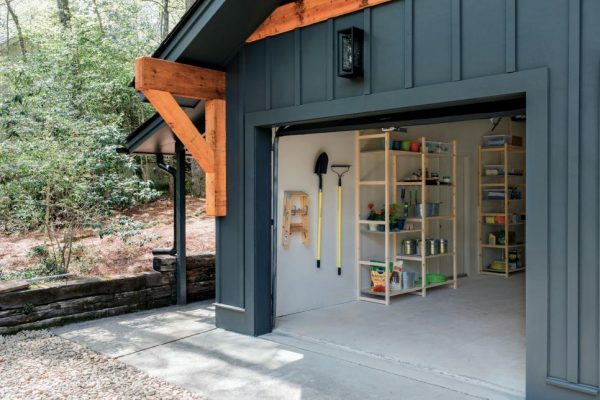 And we can’t forget the Garage space! Exterior: Hardie Trim, Batten Boards Smooth, Iron Gray. Paint Color Interior Walls: Sherwin-Williams Divine White HGSW4044. « What color is Teal exactly? love the house what color are the shingles on the roof?? also the type of hardwood floors? Hi Nancy…really love the house colors! 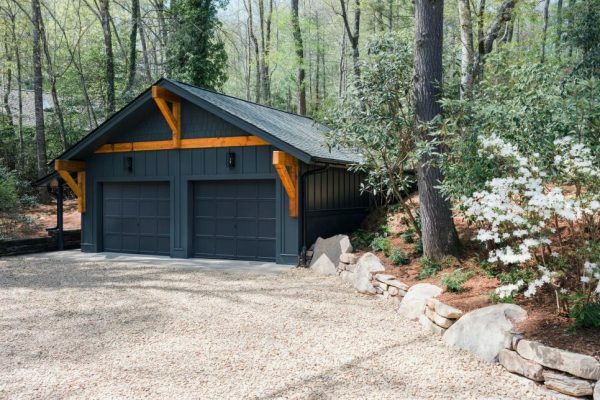 Can you tell me what color the garage doors are painted please? Also, where can I find the light fixtures you used on the exterior walls? Tbanks Nancy….I’m getting ready to paint my house to look like the retrea house. Whar color would you recommend painting the front door of this house if not wood?